As small as we may like our cars, there's only so much we can be disappointed that Ford won't be offering econo-boxes like the Fiesta and Focus in America anymore. What really gets us is that we won't be able to get our hands on the hot-hatch versions. But Dearborn has been somewhat assuaging our FOMO (that's "Fear Of Missing Out," for those of us born before the 1990s) by applying the ST treatment to crossovers like the Edge, the Explorer, and maybe – if we ask nicely enough – the new Escape as well. 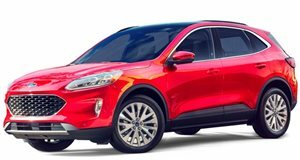 Speculatively drawn up (above) by prolific automotive artists Kleber Silva (red) and X-Tomi Design (teal), these renderings show what just a vehicle might look like, based on the new compact crossover that Ford just revealed as the Kuga for Europe and the Escape for North America. And we think they look pretty spot-on. As it is, the new Escape/Kuga will be available with a 2.0-liter turbo four capable of producing 250 horsepower and 275 lb-ft of torque. 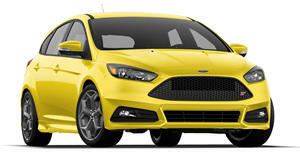 That's already about on par with the outgoing Focus ST, and a heck of a lot more than the Fiesta ST.
All Ford is saying at the moment when it comes to performance is that the new Escape will be about 10 percent quicker in the run up to 60 than the outgoing model, which would place its sprint around 8.3 seconds (give or take). That'd be a good couple of seconds behind the lighter and nimbler outgoing Focus ST, which just goes to show that the Escape has room to improve. And we think the 2.3-liter EcoBoost four from the Mustang, the outgoing Focus RS, and the new Focus ST (being sold overseas) would do just the trick... don't you?